Greeks in Ukraine are a Hellenic minority that resides in Ukraine or used to live on territory of modern Ukraine. Most of them live in Donetsk Oblast and particularly concentrated around the city of Mariupol. According to the 2001 Ukrainian Census, in Ukraine resides 91,548 ethnic Greeks that is 0.2% of whole population of Ukraine. However, the actual percentage of those with Greek ancestry is likeky to be much higher, due to widespread intermarriage between ethnic Greeks and those Ukrainian citizens who are Russian Orthodox, particularly in eastern Ukraine, and the absence of strong links to Greece or use of the Greek language by many with Greek ancestry in these areas and who therefore are not classified as Greeks in official censuses. 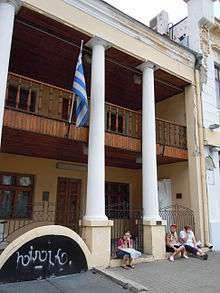 Greeks in Ukraine belong to bigger Greek diaspora known as Pontic Greeks. A Greek presence throughout the Black Sea area existed long before the beginnings of Kievan Rus. For most of their history in this area, the history of the Greeks in Russia and in Ukraine forms a single narrative, of which a division according to present-day boundaries would be an artificial anachronism. 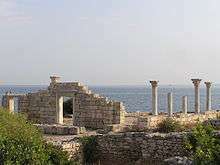 Greeks established colonies on what are now the Ukrainian shores of the Black Sea as early as the 6th century BCE. These colonies traded with various ancient nations around the Black Sea, including Scythians, Maeotae, Cimmerians, Goths and predecessors of the Slavs. These earlier Greek communities had, however, assimilated into the wider, indigenous population of the region. The Greeks of present-day Ukraine are mainly the descendants of various waves of especially Pontic Greek refugees and 'economic migrants' who left the region of Pontus and the Pontic Alps in northeastern Anatolia between the fall of the Empire of Trebizond in 1461 and the Russo-Turkish War of 1828-29, although some had settled in Ukraine in the late-19th or early-20th centuries. Other Greeks arrived in Ukraine even later, particularly, as Greek Communist refugees from mainly Greek Macedonia and other parts of Northern Greece, who had fled their homes following the 1946-49 Greek Civil War and settled in the USSR, Czechoslovakia, and other Eastern Block states. 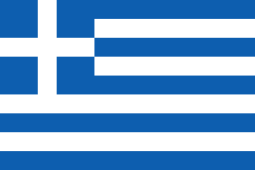 However, even among these late arrivals there were many communist Greek refugees who settled in Ukraine following the Greek Civil War who were in fact Pontic Greeks or Caucasus Greeks, and therefore often had ancestors who had lived within the southern territories of the Russian Empire before settling in Greece in the early 20th century. After the Cumans and Mongol-Tatar invasion of the steppes of southern Ukraine and Russia to the north, Greeks had remained only in the towns on the southern slopes of the Crimean Mountains, and became divided into two sub-groups, Tatar speaking Urums and Rumaiic Pontic Greeks with Rumeíka Greek as their mother tongue. These lived among the Crimean Tatars until the Russian Empire conquered the Crimea. Then Catherine the Great decided to relocate the Pontic Greeks from Crimea to the northern shores of the Sea of Azov. New territory was assigned for them between today's cities of Mariupol and Donetsk, covering the southern portion of the Donetsk Oblast in Ukraine. Ukrainians and Germans, and afterwards Russians, were settled among the Greeks. The Ukrainians mostly settled villages and some towns in this area, unlike the Greeks, who rebuilt their towns, even giving them their original Crimean names. Since this time in Ukraine the names of settlements in the Crimea match names of places in the south of the Donetsk Oblast: Yalta-Yalta, Hurzuf-Urzuf, etc. During 1937-38 the Pontic Greeks endured another deportation by the Soviet authorities known as the Greek Operation of NKVD. By the 2001 census 91,500 Greeks remained, the vast majority of whom (77,000) still lived in the Donetsk Oblast. Higher estimates such as 160,000  were reported previously, the fall being explained by assimilation forced by the Soviet government. Other small populations of Greeks are in Odessa and other major cities. Greek Coin from Cherronesos in Crimea depicting Diotimus 2nd century BCE. Wikimedia Commons has media related to Greeks in Ukraine. Coins of Olbia: Essay of Monetary Circulation of the North-western Black Sea Region in Antique Epoch. Киев, 1988. ISBN 5-12-000104-1. Coinage and Monetary Circulation in Olbia (6th century B.C. 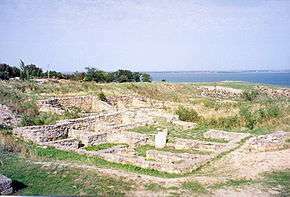 – 4th century A.D.) Odessa (2003). ISBN 966-96181-0-X.